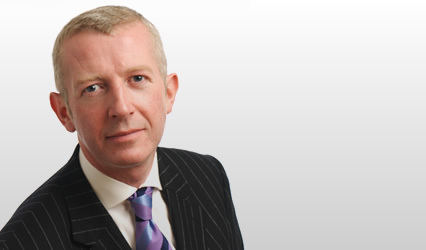 Addressing the subject “Choosing the judges: the controversy continues”, Westwater Advocates’ Calum MacNeill QC participated on Friday [30 March 2018] in a panel discussion with Lord Neuberger and Liam McCollum QC, leader of the Northern Irish Bar. 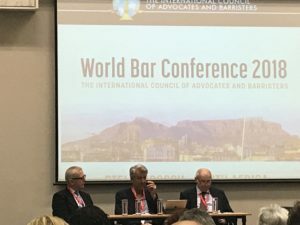 The session, at the World Bar Conference in Stellenbosch, South Africa was chaired by Justice David Barniville of the Irish High Court. After each panel member had addressed the conference on current approaches to judicial appointments, there was a lively discussion amongst participants from the UK, Ireland, South Africa, Namibia, Hong Kong, Australia and New Zealand. The International Council of Advocates and Barristers was established at the first World Bar Conference in Edinburgh in 2002 and is a forum for members of independent referral bars throughout the world. Left to right: Calum MacNeill QC, Liam McCollum QC and Lord Neuberger.